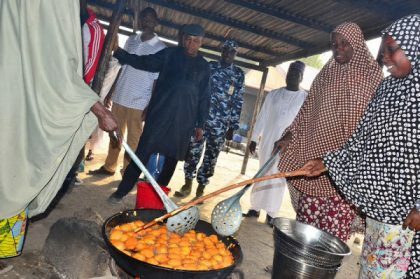 Isa Gusau, Maiduguri: Worried by drop in quality of food served boarding students, Borno Governor, Kashim Shettima on Wednesday inaugurated a special committee to handle an improved feeding across 78 secondary schools during which he revealed plans to engage undisclosed pupils as spies who will be sending him messages via telephone and social media platforms to give hint on the quality of meals being served at dining halls. The new committee is chaired by the Commissioner for Education, Musa Inuwa Kubo who is a highly experienced school administrator with representatives of the Parents Teachers Association, the Nigeria Union of Teachers and other stakeholders. 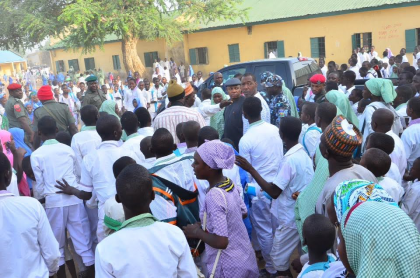 Governor Shettima had paid an unscheduled visit to a secondary school last month and went straight to the kitchen only to discover that meals being served fell short of the standard he had raised since 2012 when he raised the monthly allocation of boarding pupils feeding from N20m he inherited to N100m entrusted to a committee he felt was no longer necessary after Principals adjusted to distributing improved and good portions of meals for pupils, a program most parents celebrated. Following his discovery, Shettima decided to reconstitute a 17-member feeding committee that comprise some Government and non Government officials which he inaugurated in Maiduguri with a mandate of being responsible for procurements of food stuffs, distribution to schools, monitoring of cooking and quality of meals and to supervise efficient distribution of reasonable portions to pupils. “Apart from approving funds, I will also help you to do your job. Do not feel that I am being suspicious. As you all know, I do visit schools but this time around, I will give some students (you will never know) my phone numbers to communicate directly with me to give me regular updates on the quality of meals they are being served henceforth. You as committee members should address the principals and call them to order. I will urge you to directly procure the foodstuff and give it to the principals of our respective boarding secondary schools. And it is within your mandate to hire and pay the salaries of cooks where there are shortages of kitchen personnel. I want all of you to work hard and identify some sacrificial lambs. I want you to deal with two or three principals who shortchange pupils in their feeding. As I have always said, education is very important to the development of any society and we owe an obligation to humanity, to posterity to fix public schools in Borno. ‎With the way we are building schools, some people would feel we are crazy because they forget that Boko Haram has taken our education backward and created thousands of school aged out of school children. “We are buying lands, we are buying premises and building schools on them and we will make these schools function effectively” the Governor said.